The Mandala of Time: What time is it? Why is time considered the 4th Dimension? Our normal 3 Dimensional experience is static. Movement, Change and "Time" is the 4th Dimension. A dimension of movement through, cycles within cycles within cycles with an abstract human invention called linearity. I’m running late for an appointment. My anxiety level is rising fast. Suddenly, I remember to take a “holy instant,” a moment in my mind (as my body is moving very quickly toward the meeting) to accept forgiveness for myself for being late, and forgiving the organizer of the event for scheduling the meeting in the first place! I once heard that according to psychoanalytic theory, if you are late to an appointment you are considered hostile. If you are early you’re anxious. And if you are on time you’re compulsive. You can’t win! As a child and young adult I never gave time much thought.Then in my early 20’s I read a book by Alan Watts, about the Hindu concept of “Yugas.” Alan had a gift for transmitting a sense of wonder and curiosity about life and existence that I couldn’t resist. I later read a book by Benjamin Whorf, who studied the Hopi Indians and their conception of time. It brought me to see that what we commonly call “time,” is a conventional idea largely conditioned by the culture or society in which it is used. I read more and more of Watts writings and listening to recorded lectures wanting to understand his view of time and also space. It was as though I was discovering a part of existence and life I had never been aware of before, although obviously, I was living immersed in it. It was as though by beginning to think consciously about time and space, I was moving “outside the box” of time and space. Most of us are taught in childhood and later, that time is a linear straight line moving from past through the present into the future. Even though most of us could see a round clock with the hands going round and round. Were there two kinds of time? Time becomes a “flat line” proceeding into an indefinite future--all quantity no quality--all length and no depth, all objective events, no interior meanings. Unfortunately, this view of time is a product of a mechanistic reduction, taking no cognizance of novelty and creative emergence. The novel emergents come from the timeless dimension breaking through into time, which the linear view of time does not generally recognize. The present is rapidly turning into the past. The future is always ahead. If creativity doesn’t happen “now” it never will, but the now seems very tiny. There isn’t much room (time) for the new to emerge. To get a sense of how quickly “now” comes and goes, get a tick-tock clock, or metronome, and listen to the ticks. The new has to emerge within the space of the ticks otherwise it is the past or future. Not much time for “now.” To experience the absurdity of this, we could even continue to divide the now into smaller and smaller units, reaching the nano realm, “nano-ticks,” and have even less of a now. Well, it’s educating to imagine this and how little time we have for the now while it quickly turns to past or is relegated to the future. On the spiritual path we often hear that time is an illusion. Let’s take a trip in our imagination to see why. Blasting off from earth, we can still see the reference points we have for our objective time-sense. Leaving off our subjective time-sense for a moment, we look at our digital clock, or analog clock, or just focus on the sun, moon and earth for our chronological orienteering. As we speed toward Arcturus, and leave our native solar system behind, we begin to focus more on our watch or clock, and less on the physical universe around us as our ancestors did, to answer our question of “what time is it?” Let’s say we are now mid-way between Earth’s solar system and Arcturus. The Sun is now a small point of light, and so is Arcturus. There is nothing now to watch objectively that rotates in circular, rapid fashion. Now we notice our watch batteries are dead. Our biological clock now becomes the prominent measure. We realize that conventional “time” is motion and energy-dependent. Without the sense of movement we don’t have a sense of time. Without change, we have no awareness of time. Now we are into “naked time,” or “real time”. Things seem to be “just happening” without any particular order. It is very difficult to keep a linear conception going without a sense of movement This is an approximation of what the Zen Buddhists call, mutual arising, spontaneous arising – there is nothing “trailing” something else. It is called Thusness, or Suchness. The spring doesn’t “become” the summer. In this space there is no problems because there is no sense of opposition. A witnessing state of mind observes without any sense of before or after, only being, no becoming. Ordinarily our minds work very hard to maintain the sense of motion, "becomingness”. If we unlearn it, and slip out of the clock/time process occasionally, we can enter into the domain of Tatahaga, only moment-to-moment arising of experience. There is nothing “causing” something else, only a mutual dance, an inter-play of spontaneous relating. This is a transpersonal experience, not to be confused with the infants, pre-personal, pre-temporal experience of living only in, and for the moment. Thus freed for a moment from the driven-ness of time and change, which still goes on, with or without our attention in the background, we experience the Eternal Now, the Golden Present. We realize that there is no Absolute, or Ultimate Standard of location or time, we literally are lost in time and space. Since space and time are really space-time, a nice means of increasing our sense of time when we are feeling short of time is to increase our sense of space, and vice versa. More on that later, when I discuss A Course in Miracles view of time. On an analog clock we have a middle stationary post, non-moving anchor, while the hands move around it giving us the time of day. This reminds me of the maypole ceremony in May where everyone “dances” around the central, still pole. The static center of the pole remains steady while the people rotate around it. In other words, it takes a sense of two-ness, a duality to produce the sense of time as we normally think of it, a something moving contrasted to something stationary. Our clocks and calendars are measuring systems that are useful. They are also completely arbitrary, only one system among many possible systems of measurement. The Mayans (I sometimes wonder if their name is completely a coincidence, given the Hindu term for time and space is “Maya”), for example have a completely different system of time measurement, recognized by several scholars as far superior to our own. This conventional measurement (causing a beginning, middle and end) is the sense in which the spiritual teachers of the perennial philosophy have said that what we perceive as the world is maya, an illusion. As all measurement is an agreed upon conventional device, so is the time we take for granted (we’ll explore that further in a moment). Why an illusion? "What is the world except a little gap perceived to tear eternity apart, and break it into days and months and years?" There is many ways to measure, and there is no ultimate method. There is only a conventional agreed upon way that may be changed if a better way is found. And if this is so, then waking up to the reality would entail perceiving, knowing and using time in a number of different ways. It seems that if we have all of eternity to divvy up then, we can slice it anyway we like; for whatever purposes we may have for measuring it. In our spiritual development there comes a time when we realize that there is only One Still Point, and that is our True Self, and everything moves relative to That. The True Self is the One Eternal Constant, within and without. The One Fixed Witness of All that Is. All time revolves around That, which is Eternal Brahman, the One True Static. In the meantime, we can learn to move in and out of the daily clock round, and live occasionally in the eternal, Golden Present. By practicing that Presence daily, in meditation and out, we can regain the forgotten ability we have for “living in two worlds,” the world of time and the timeless… an undifferentiated now. We can conceive of time in two different ways, awareness of time as a vertical move in our minds, timelessness- no movement. Or we can see time as a horizontal, linear arrow moving forward, never backwards. Our deeper experience is a wholeness, then using the clock, calendar or hourglass as our “knife” we slice into this wholeness. Time as concept is an invention, a consideration, an idea in our minds. That is why there are so many kinds of time. There is clock time, event time, biological time, work time, party time, baseball time, football time, astrological time, astronomical time, objective time, subjective time, time of the nano-second, light-years, winter time, summer time, seasons, periodicities, time as a wave, time as a particle, past time, present time, future time, all kinds of time; to name only a few! In earlier days we measured time by the length of a burning incense stick. Time, more and more, seems to have an illusive identity, hard to pin down. I guess that’s why it has always been declared an illusion by the perennial philosophy. So when we began to measure out eternity, we began to become like the sorcerer’s apprentice who lost control of his creation. It was possibly too much of a good thing, which all technological inventions can become. The idea of measurement comes into play especially around the idea of time. We can become so focused on the objective measurements and instruments of measurement, and we tend to overlook what it is we are measuring, which is eternity itself; the timeless background of all the units of time that we are measuring. We tend to see only finite units of measure, not the immensity of what it is we are measuring. We fixate on the measurements (time), losing the sensation of what’s being measured (eternity). And thus arises the sense of scarcity, lack of time and space. Wherever we find space we find time as well. They are only two parts of one unity. To have something moving needs a space to move in which takes time. Space and time are a functional unit in experience. The Course gives a good example of how to sneak up on this illusion to see through it. Space as we experience it is very similar to our experience of time. But, in space our body comes more into play. You only believe you move around when you identify yourself as a body, or believe you are in a moving body of any kind. It could be a car, a plane, a bus, etc. By practicing sensing yourself not moving, it’s only your body that is moving, you can gradually in many cases, re-connect to your Motionless Self. That is the secret. To stop believing you are moving about just because your body is. Of course measuring distances, spaces, dimensions all arise as a result of the bodies moving in space. Again, these conventions are useful, but not final, ultimate truth. “Are we almost there yet? !” asks the child, and we are at a loss to explain it in terms of space or time. Their minds haven’t yet developed the conceptual and operational skills to measure to that degree. “Almost,” we say. Time is basically a locational idea. Like “I,” we use time as a way to locate ourselves and things, in a basically location-less universe. All location is a limiting of a basically Unlimitedness. That’s why we can’t determine an absolute location for subatomic particles. There isn’t any absolute location in time or space. When we practice seeing time and space as a mandala, with us at the center, and everything happening all at once all around us, this can act as a corrective to the more illusory idea of only moving along on a timeline. We can experience time kaleidoscopically, as inter-related patterns constantly changing around our central witnessing view. Experiencing time as a flatline is one of the least interesting, and more anemic ways of looking at time. Studying skeletons for anatomy is useful in some fields, but for most of us a mere curiosity. 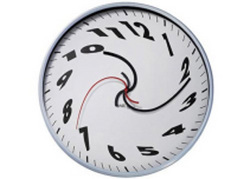 We can say that it is a “horizontal” view of time, and concrete duration. Seeing time as only an arrow moving from point a to point b, may be useful for some things, but I question if we really need it for a wholesome day to day experience of life. 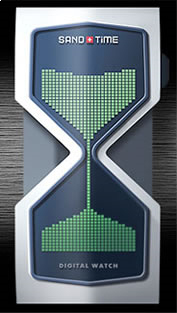 **Click here for more information about the Hourglass watch above. It is an excellent merger of the old and the new. It's designed like an hour glass, but it's a digital watch. The Hourglass Watch has a nice digital display with ordinary numerals for telling standard time and the stop watch is an hourglass. It's a fun fashion accessory overall. It's simply a concept so far, hopefully it will go into production soon. ++ The Dali Melting Time Wall Clack is available to buy online from Perpetual Kid. This clock is inspired by Salvador Dali’s surreal paintings. The Dali clock is the perfect complement to those days when you want to watch time melt away!